Bringing to vivid life true Australian war history and events, “No Greater Love” is a saga of the drama, beauty, heroism and horror of a young Australian Spitfire pilot’s war journey through stunning Malta, Egypt and North Africa, Sicily, England and Europe. It is also a salute to the hero girls the war places on his path, a portrait of the tragic, wholesale waste of war, on occasion even the profound humanity of his enemy. “No Greater Love” is the story of Aussie rough-diamond, Colin Stone, of his loyalty and devotion to his friends, of his enduring love for the mother who abandoned him, and his dreams of being held by her once again. 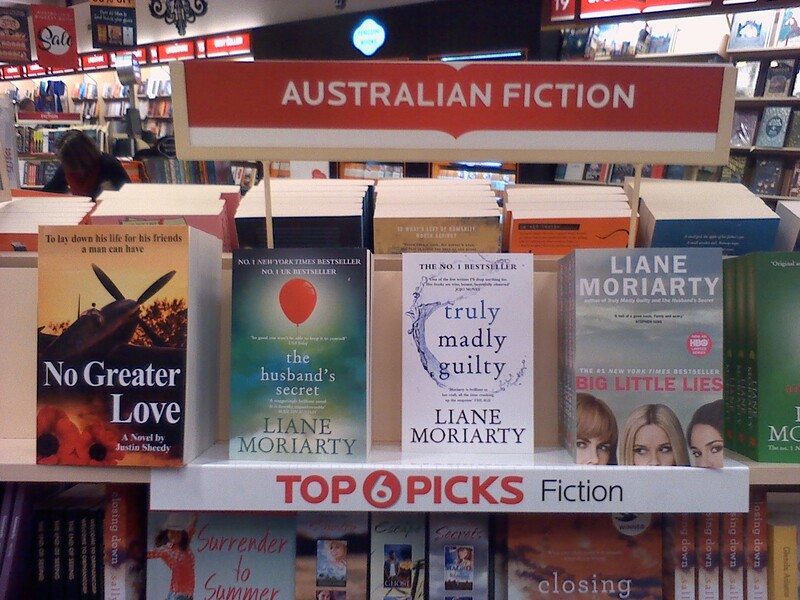 Since his latest book-signing, Justin Sheedy’s fifth and latest release, No Greater Love, has been a Number 1 Best-Seller at Australia’s premier bookstore, the iconic Dymocks George Street Sydney. He is now delighted to have been invited to further signings at Dymocks Macquarie and Dymocks Broadway, two key bookstores which have supported his literary rise and rise over the past few years. Bringing to vivid life true Australian war history and events, No Greater Love is a saga of the drama, beauty, heroism and horror of a young Australian Spitfire pilot’s war journey through stunning Malta, Egypt and North Africa, Sicily, England and Europe. It is a salute to the hero girls the war places on his path, a portrait of the tragic, wholesale waste of war, on occasion even the profound humanity of his enemy. No Greater Love is the story of Aussie rough-diamond, Colin Stone, of his loyalty and devotion to his friends, of his enduring love for the mother who abandoned him, and his dreams of being held by her once again. 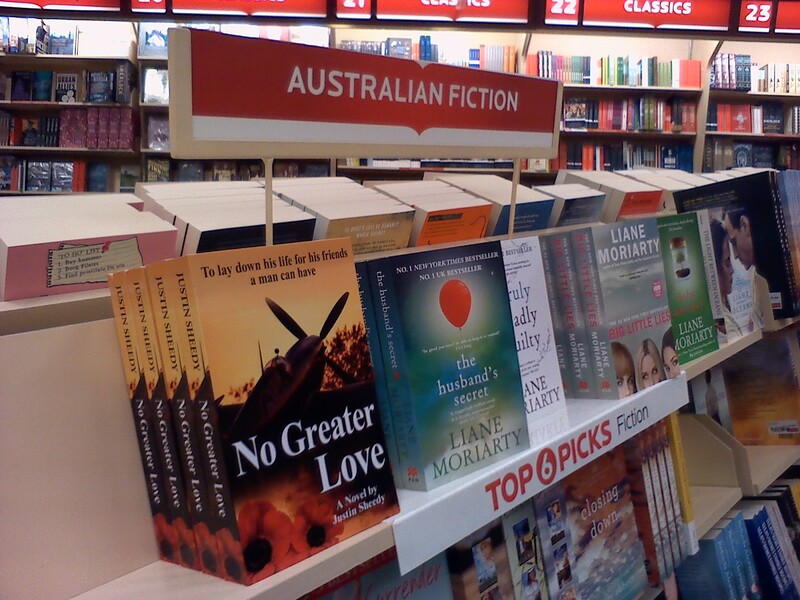 Justin Sheedy’s latest book, “No Greater Love”, is Officially NUMBER ONE BEST-SELLER for Australian Fiction at Australia’s premier bookstore, Dymocks George Street Sydney. If you’ve not yet read his already highly-acclaimed World War II historical fiction, you can pick it up or order it in at your local bookstore, if outside Australia via Amazon, Waterstones Online, Barnes & Noble Online or The Book Depository. Come & meet author Justin Sheedy with Kim Kelly, Michelle Morgan & Winton Higgins at “Wings into History: How the Past Inspires Historical Fiction” at the Gordon Library, Sydney, on Wed 26 July, 6-8pm, where author Elisabeth Storrs will chair an author panel on their shared passion, writing Historical Fiction. Proudly supported by the Ku-ring-gai Council, see their website link for full details. Only $5 admission but bookings essential. This is a ‘Sydney Satellite Event’ leading up to the Historical Novel Society Australasia 2017 Conference in Melbourne this September where all 5 will feature in the company of 60 leading Historical Fiction authors sharing their passion with readers for what they love. A very many women don’t read war stories. Until they read Justin Sheedy’s war stories. He is delighted to be signing his latest at Dymocks Sydney once again. Bringing to vivid life true Australian war history and events, “No Greater Love” is a saga of the drama, beauty, heroism and horror of a young Australian Spitfire pilot’s war journey through stunning Malta, Egypt and North Africa, Sicily, England and Europe. It is a salute to the hero girls the war places on his path, a portrait of the tragic, wholesale waste of war, on occasion even the profound humanity of his enemy. AUTHOR TALK – Author Justin Sheedy will talk about his new book No Greater Love at Dymocks Chatswood. It is the last book in a trilogy about Daniel Quinn, former St Aloysius College student who becomes a Spitfire pilot. Sheedy will also be signing copies of the book.